My thanks to my confrère Bro. Ernest Paquet in the US of A for sending me these paraprosdokians (no, I'd never heard of the word either). Gustave Martelet s.j. (1916-2014) - rest in peace. A brilliant but humble, sensitive, affectionate, funny, loyal, wonderfully engaging person whom I had the privilege to call a friend passed away during the night of Tues. to Weds. : Père Gustave Martelet s.j., a Jesuit priest whom I got to know during my studies in Paris (1995-99) and who remained a very dear friend over the subsequent years. I saw him for the last time on my way through Paris on Jan. 3rd, 2 weeks ago. He had just come out of hospital after having suffered a major heart attack after Christmas at the age of 97... and yet survived!! My gut feeling was that this would be the last time we would meet here on earth. I think he knew it too, though he asked (as he always did) when I would be coming back to see him. Here's a link to a blog post I wrote about him 4 years ago. 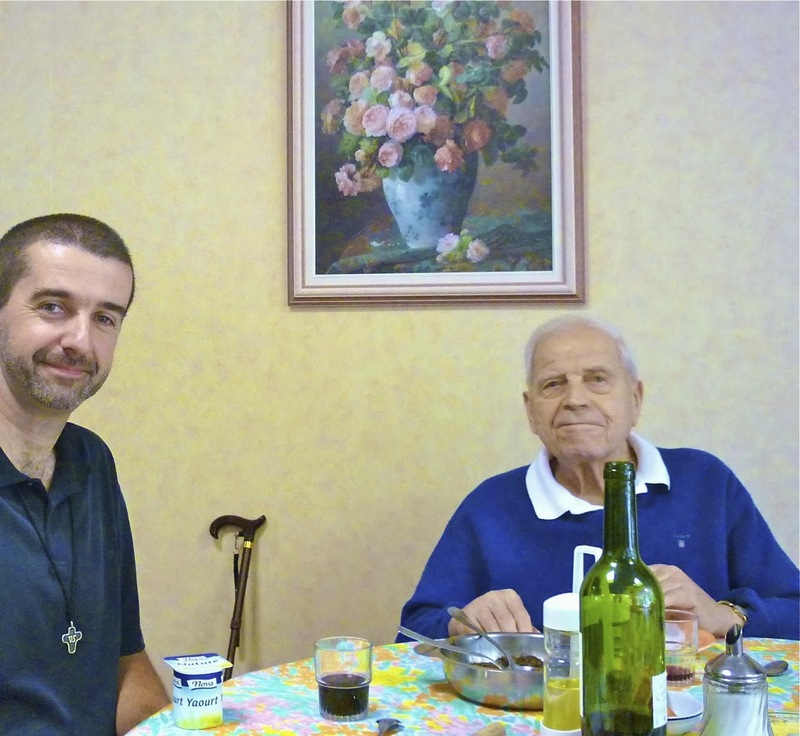 Lunch with Gustave in his retirement community in 2011. One of my all-time favourite album closers, "Where I Belong" from Switchfoot's last album, "Vice Verses" (their new one "Fading West" is out in a few days). In a world where I belong."